"Jerusalem, Jerusalem! You kill the prophets, you stone the messengers God has sent you! How many times I wanted to put my arms around all your people, just as a hen gathers her chicks under her wings, but you would not let me! And so your Temple will be abandoned. I assure you that you will not see me until the time comes when you say, "God bless him who comes in the name of the Lord.' 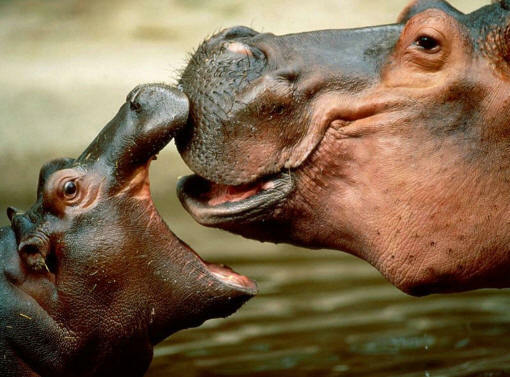 "
A few years ago twin hippopotami were born in a zoo. A local celebrity was asked to name the two babies. The only hitch was that the mother hippo wouldn’t let anyone close enough to determine whether the babies were male or female – an important piece of information when it comes to giving names. The two 18 kilo babies paddled or walked just under their mother. She cared for her babies: feeding them, protecting them, keeping them close to herself and away from danger. The baby hippos, untroubled by their nameless state, didn't stray from their mother. As young as they were, they knew that the two ton grey creature always provided just what they needed. Why should they stray? Chickens don't stray far from mother hen because they know that when danger menaces them, or a cold night threatens their lives, there is no better place to be than under the protection of the hen's wings. They know that mum provides food, protection, warmth, and nurture. They rely on their mum to watch over them while they are so small and helpless. This kind of protection and nurture is nature’s way of caring for the young. It’s like that throughout the animal world and it doesn’t matter if you’re talking about baby hippos, kittens, puppies, chickens or any other animal you’d care to mention, it seems that the young have sense enough to stay close to their protecting parent. That also applies to human babies and toddlers. God created families so that offspring can receive protection and nurture. But when it comes to people and their heavenly parent - that's another story. People exhibit the unnatural behaviour of turning away from the love and protection of the heavenly parent. Offspring in the animal world know where their protection and nurture comes from and don’t stray far from their mothers, but it’s a different story when it comes to God and his children. I believe that one of the most passionate speeches of the New Testament is Jesus words that we find in our text today from Luke 13. These words remind me of a mother whose child has broken all ties with her and has ventured on his own into all kinds of danger and trouble. She pleads, "I want to help you and protect you, put my arms around you, but you won’t have anything to do with me." Or another picture we could use is that of a lover who is rejected, his/her love unreturned; who wants to hold the other person close, to love, share, care for the other, join their lives together, but is unwanted. Each of these scenarios is packed with emotion, just as the scene in the Gospel does when Jesus is looking toward Jerusalem. He is looking at people who really need what he has to give. They’re caught up in a stressful world, filled with anxiety and despair, searching for meaning and purpose in life. He is offering them everything they need. And yet, says Jesus, the children have strayed. They not only did it once, but many times. They killed the prophets and stoned those sent to them and now they are doing it again. They rejected the love God was showing them in his Son. They refused to accept Jesus as John writes, "He came to his own country, but his own people did not receive him" (John 1:11). As a mother hen spreads her wings over her brood, so God would spread protective wings over his people. What chickens and kittens would not do - could not do – God’s children have done. They have counted the love and protection of God as nothing, choosing instead to go their own way. How could the children of Israel have been so foolish, so unnaturally rebellious as to turn away from the warm wings offered to them? Those wings had protected them from the dangers of the wilderness for 40 years. Those protecting wings saved them from one enemy after another. Those wings that came with a promise, "Even though a mother should forget her child, I will never forget you" (Is 49:15). How could we do such a thing? How can we be so foolish or behave so unnaturally as to stray from the sheltering love of God? How many times has God said about us, "I wanted to put my arms around you, just as a hen gathers her chicks under her wings, but you would not let me!" At times even the strongest among us desperately feel our lack of security, the absence of protective wings over us, the unnatural distance that seems to exist between ourselves and the calming presence of God. We blame others for the seeming distance between God and us – we blame the church, the pastor, the leaders, even God when in actual fact it’s not that God and church have moved away from us, but that we have moved away from God. Even if we could point the finger at one individual and say that person is to blame for the spiritual vacuum in our lives, you can bet that this is the case because first of all you have moved away from your God who is so loving and protecting. What is it that leads us to stray from our heavenly parent? What is it that causes us to leave the warmth and security of God’s protective wings, to say "no" to all that our heavenly Father wants to offer us? What is it that causes Jesus to say of us, "I wanted to put my arms around you but you would not let me!" This text today tells us two things (amongst others). Firstly, it reminds us of the power of sin. I know that this isn’t a popular subject for some and others are saying, "Oh no, here he goes again talking about sin." But the reality of the fact is that it is our sinful nature that causes us to ignore God’s love. Sin has the power to take control of our lives and distorts what is true and what is false. The people of Jerusalem had rejected the prophets, God’s messengers, because they could not see that they were speaking God’s Word to them. They had been blinded and become confused because of sin. Some years ago graphic scenes were beamed from USA to our TV screens of riots, the beatings, destruction of property, wholesale looting, people breaking into stores, stripping them bare of their merchandise, and laughing as they did it. A TV reporter interviewed a man who had broken into a music shop and came out carrying a box. The TV reporter asked the looter, "What did you take?" He answered, "I took gospel cassettes & CDs. I love Jesus. Praise the Lord!" There is a funny side to that incident but also something very sad. We see how sin had blinded this man. He couldn’t see that he was doing anything wrong. Sin blinds us to the fact that God loves us ever so dearly. Our stubbornness, our pride, our over inflated view of our own strength and ability blind us to the fact that we need God’s help. There is nothing wrong with asking God to help when we need strength that is beyond our own human strength. There is nothing wrong with asking one of God's people to comfort us and encourage us. But how often our pride gets in the way? We don’t want to admit that we can’t handle things. We don’t want to look incompetent, weak, unable to handle the fast balls that life bowls at us. Jesus makes it quite clear that his greatest desire is that we turn to him. He wants to help us, protect us, guide us, and comfort us; he wants to be like a mother hen and fold his wings over us, but we won’t let him. How often Jesus must call us by name and say, "I want to put my arms around you, just as a hen gathers her chicks under her wings, but you won’t let me!" This text reminds us that God speaks so clearly to us about his love for us, yet on a daily basis we are like a chicken who strays away from God and all that he can do for us. The second thing that this text tells us is that Jesus loves us more than we can imagine. Otherwise why was he so upset over Jerusalem? Passionately Jesus lamented, "O Jerusalem, Jerusalem...How many times have I wanted..." How many times do you suppose Jesus looked at the crowds and saw them as sheep without a shepherd? How many times do you think he was filled with compassion as he saw their need for love, forgiveness, healing and purpose in life? "How many times...," he said. How many times must he have looked at the leaders of his time and wanted to help but they would not let him. As God is unchangeable so also is his love for us. No matter how far we have wandered from him; no matter how deep our sin might be; no matter how far into the far country we have gone, Jesus loves us. He will never leave us nor forsake us. He continues to love you and me even when we’re not very lovable. Jesus doesn't want us to go it alone. We are a brood of helpless hatchlings hidden under our Saviour’s protective wing. He calls us again and again to duck under his wing, to find shelter and safety under his outstretched arms. Those arms were extended on the cross bearing your sin. They extended over you in your Baptism. They extend over you when the sign of the cross is made and the pastor declares God’s forgiveness for all your sin. His arms extend over you in Holy Communion as Jesus feeds you his own body and blood. The baby bird that tries to go it alone, that stubbornly insists on doing its own thing away from its mother's protective wing, will die. Jesus words in our text also contain a word of judgement for those who persistently reject God and his love and stray from his protection. Jesus gives this warning to help us realise that God is dead serious when he says he is our mother hen who wants to embrace us under his wings. How precious, O God, is your constant love!